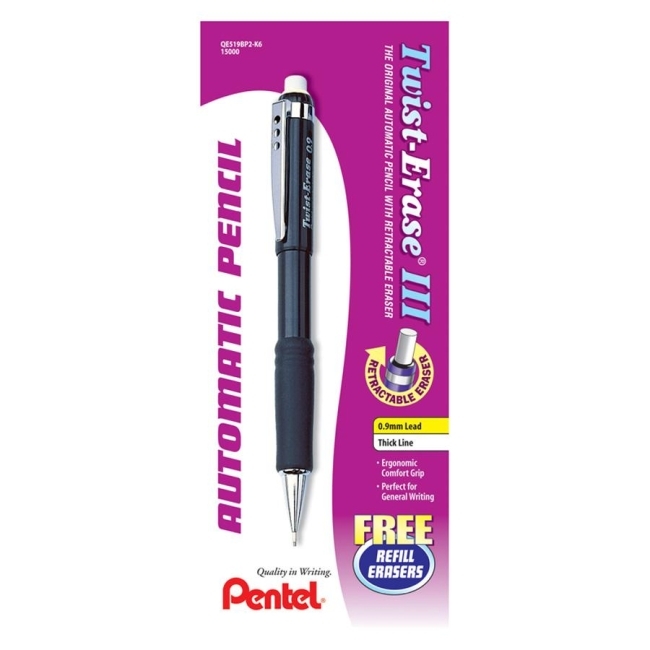 Twist-Erase III Mechanical Pencils feature a sturdy, well-balanced barrel that makes it the most popular Twist-Erase Pencil. Protective tip design stabilizes lead to reduce lead breakage. Latex-free grip delivers maximum comfort and control. With the jumbo Twist-Up Eraser, you'll suffer no smudges, no paper tears and no ghosts. Each mechanical pencil is preloaded with Pentel Super Hi-Polymer HB lead. Lead never needs sharpening, is super strong and produces a clear dark line that scans on standardized tests. Pencils are refillable with Pentel Super Hi-Polymer Lead and E10 jumbo refill eraser.